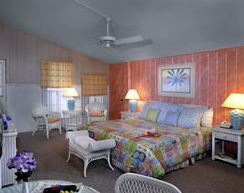 Each room has its own unique decor with distinct vaulted ceiling and paddle fans, with a choice of two queen or one king size bed. Also, each room either overlooks our courtyard or pool and a barbecue are is available for guests to prepare their own special dish. For a quiet read, visit our lending library. Ocean drive provides shopping and recreation, top-rated restaurants, exclusive boutiques, a children’s park and a beautiful protected beach, just steps away. Vero Beach, also offers some of the most culturally satisfying artistic exhibits, craft shows and musical events, as well as award-wining theater productions.